in 360i News, Influencer Marketing with tags #FuelGood, Food hybrid, Michael Bagley, The Bruffin, What's Trending Both comments and trackbacks are closed. Working in an always-on environment can mean operating at a frenetic pace, putting in long hours or making the occasional Saturday trip to the office. That’s why ad agencies and tech companies are known for creating fun, socially-friendly office spaces and building a strong culture among their employees. At 360i, we have a special taskforce comprised of people from all corners of the agency whose purpose is to reinvent existing cultural and social initiatives through their own lens. Instead of having Human Resources ideate in a vacuum, it’s a collaborative process that has led to the introduction of several employee-inspired initiatives, such as the 360i FuelGood Program. One of the more recent ideas put into action is 360i’s “What’s Trending” series – an initiative that combines fun perks and giveaways with thought leadership from beyond our industry. Monthly “What’s Trending” events celebrate innovative ideas that are either trending in pop culture now, or are predicted to be trending soon. The first “What’s Trending” event centered on The Bruffin, a rising star in the food remixing movement featuring a delicious brioche-style muffin that’s stuffed to the max with regionally themed ingredients. We invited Michael Bagley, creator of The Bruffin, to speak to our team about the product and dole out some samples. 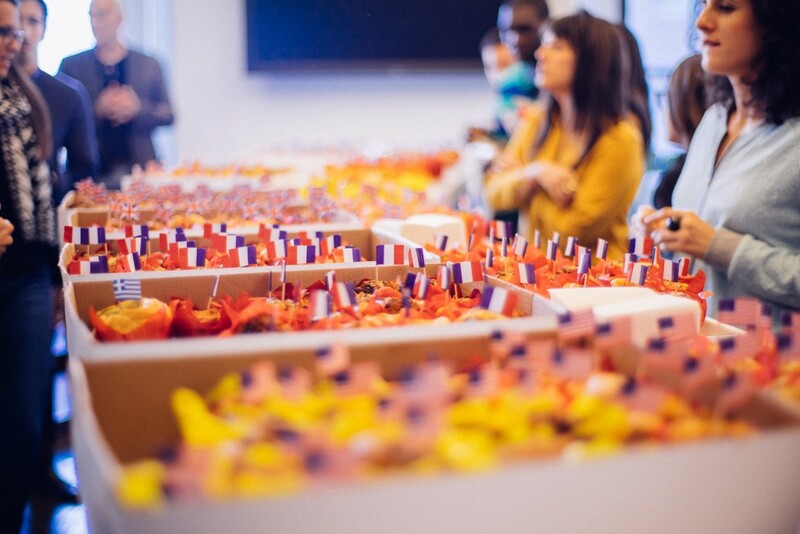 Following some insights on the development of this “meal-in-a-muffin,” and a quick synopsis of the company’s current business plan, Michael took questions from 360i-ers as they sampled a six-country tour of internationally-themed Bruffins – from British to Greek inspirations – each topped with the respective country flag. Photos via Luigi Mondi and Allison Kwan, respectively. Hungry for more details behind The Bruffin and how its creators are promoting it amid New York’s ever-competitive food scene? Read our Q&A with Michael Bagley. Cover photo via Marshall Fleming.